Welcome to the Sunday craft session at On Sutton Place! 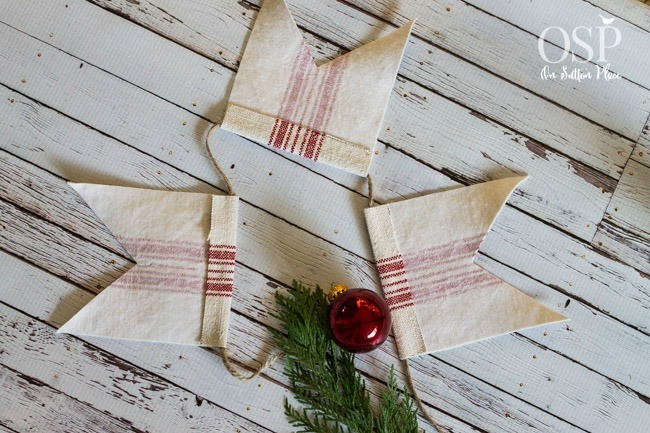 No sewing skills required because all three of these projects are completely no sew and easy as can be. First up is the grain sack Christmas tree garland I showed you during the Grain Sack Tour. I made this from an antique grain sack but you could use anything you have on hand. Burlap, drop cloth, felt, fat quarters. If you don’t have any fabric you could use scrapbook paper or book pages. Seriously anything at all will work. The first thing you need to do is make the template. Don’t blink or you’ll miss it because it’s that easy. 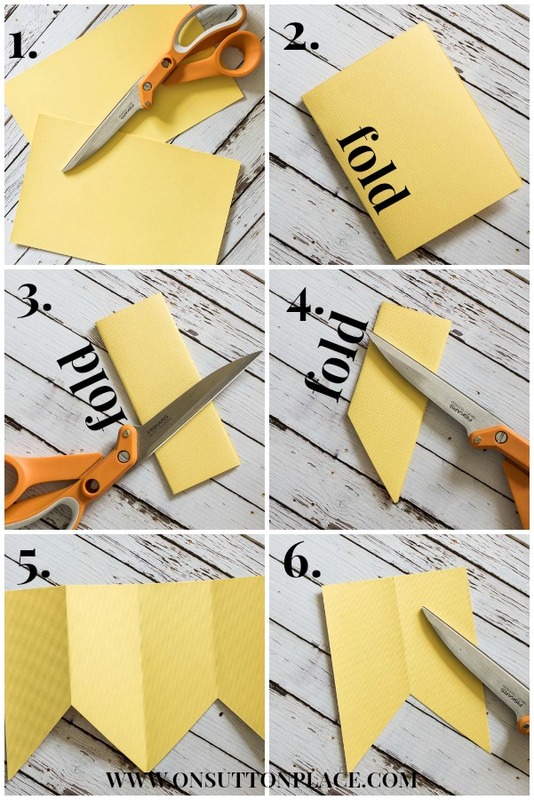 Fold a piece of paper or card stock in half and cut along the fold line. Fold one half-sheet in half. Then fold that in half again. You should have a little folded up piece of paper that looks like picture no. 3. Cut the corner off at an angle as shown in picture no. 4. Unfold it and you will actually have two templates. Cut them apart and you are ready to trace. Since I used a grain sack, I wanted the stripe to run along the middle of each garland piece. 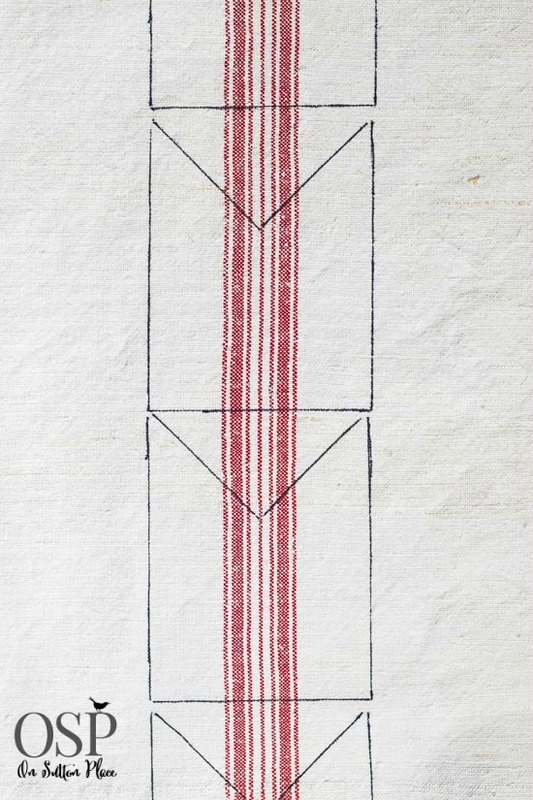 If you are using burlap or some other fabric, just randomly trace your template. 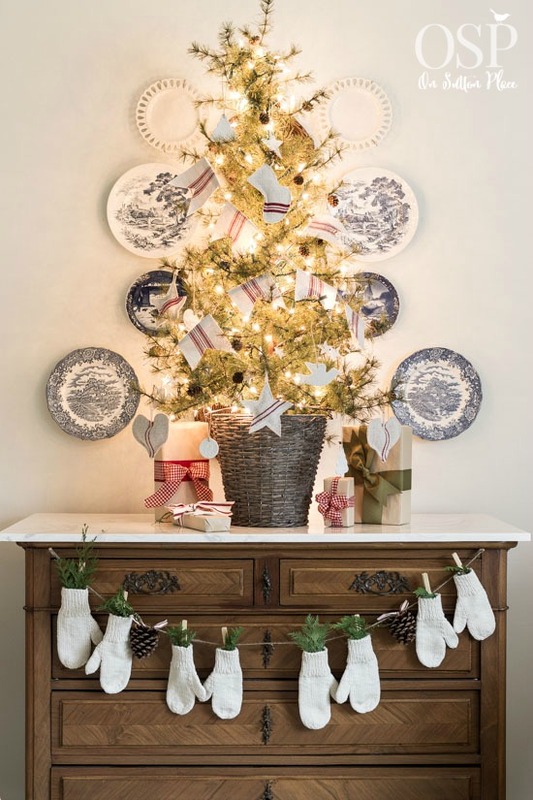 You can make as many as you want depending on how long you want your garland. Totally up to you. I only had a small piece of this grain sack so my garland had just 7 sections. It was still plenty to go across the front of my little tree. Cut out your pieces inside the tracing line so it doesn’t show. Press the straight end of each piece over about 1/2 inch. 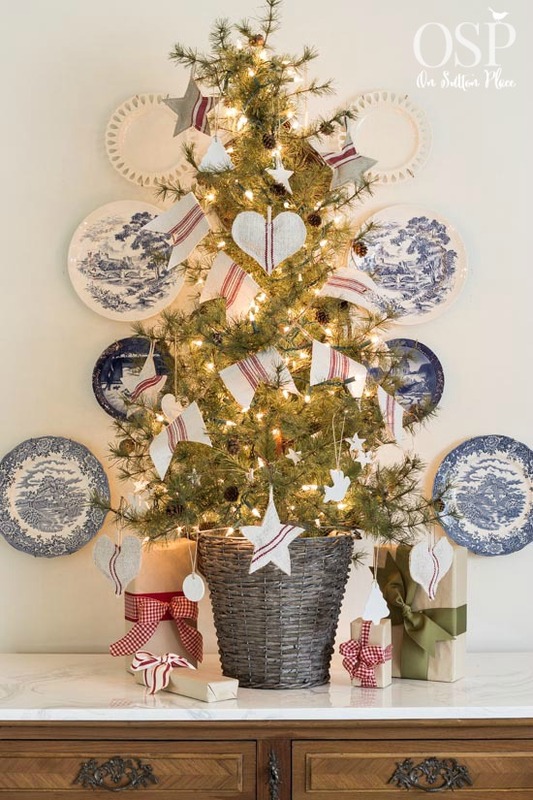 Lay them out on a flat surface and run a piece of twine under the fold of each section. Glue the folds down making sure not to glue the twine. I used hot glue but you could also use any kind of fabric glue. Since my garland was a little short to wrap around the tree, I cut the twine and made 2 banners. It was easy then to just criss-cross them on the front of my tree. I am almost embarrassed to include this mitten banner as a tutorial because there really isn’t much to it. I hung mittens on a piece of twine with clothes pins. I added fresh pine to each one and that was it. I found the mittens at an Etsy shop called The Knitty Gritty Shop (aff. link) and they are so cute. You could totally make this with mittens you already have or just get some at any discount store. I even saw mittens and gloves at Kroger. I think it would be so meaningful to use mittens that belonged to your children or grandchildren. My kids probably had 25 pairs of mittens between them as they were growing up and I didn’t save one single pair. Keep that in mind the next time you clean out your coat closet. 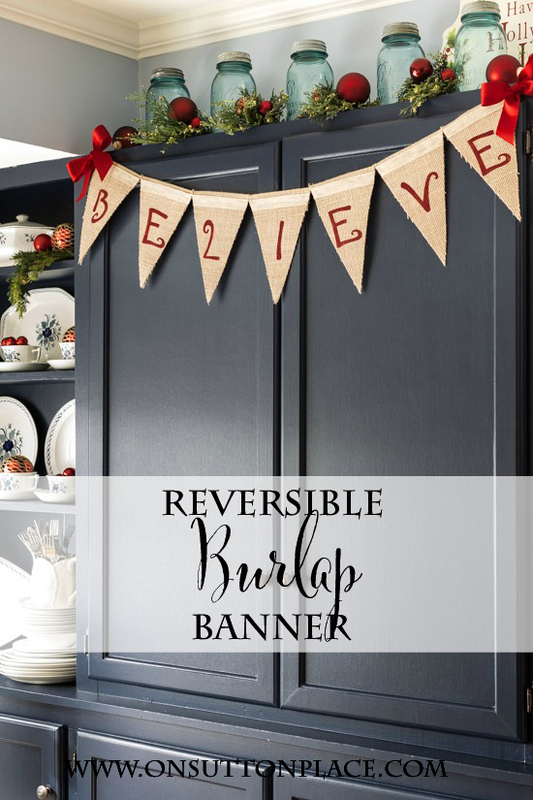 I actually made this banner to hang across the window in my dining room. I had it all hung up but I could not get one decent picture because of the light coming through the window. So I moved it to the chest and now I don’t know if I’m going to use it in the window or not because I love it on the chest too! Decisions, decisions. This is a post from last year but I wanted to include it because it’s so easy and does double duty because it’s reversible. Here is the tutorial and here is how to finish the reverse side. Thank you for stopping by…I hope I didn’t overload you with ideas but I wanted to get these out so there would be plenty of time if you wanted to make one. I probably should have had them out even earlier. 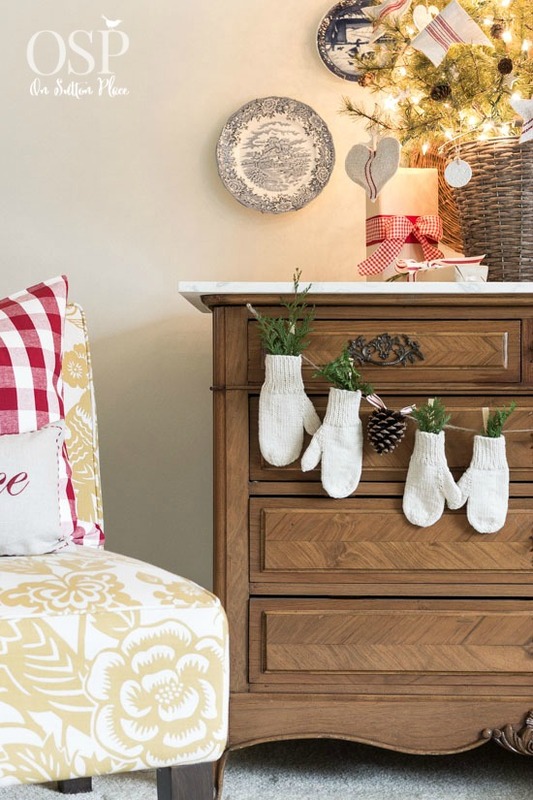 Have a lovely day…I’ll see you Tuesday with my Christmas Home Tour. 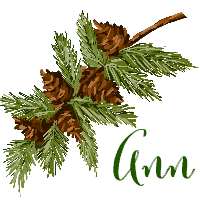 Ann, I just recently started following your blog, and I love everything about it! I like to scrapbook and make banners and garlands, etc. 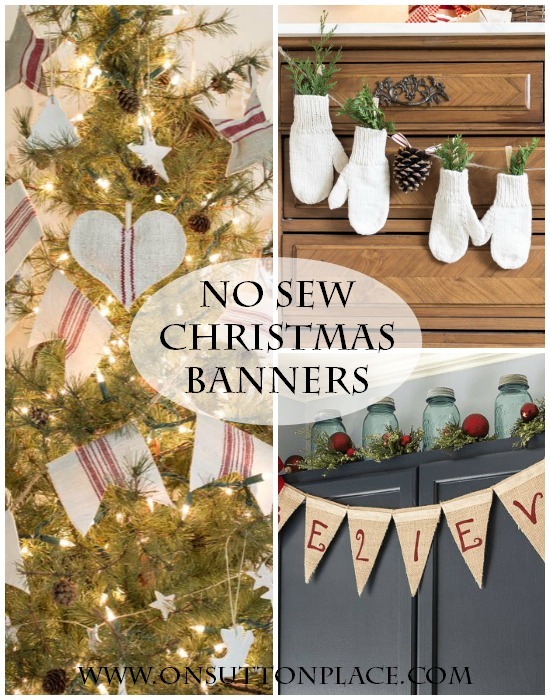 All of these crafts can easily be made with scrapbook paper, but I especially love the mitten banner using real mittens! I’m going to make it this week! Merry Christmas! Hi Pam…welcome to On Sutton Place! I’m glad you are following along. Happy Holidays! 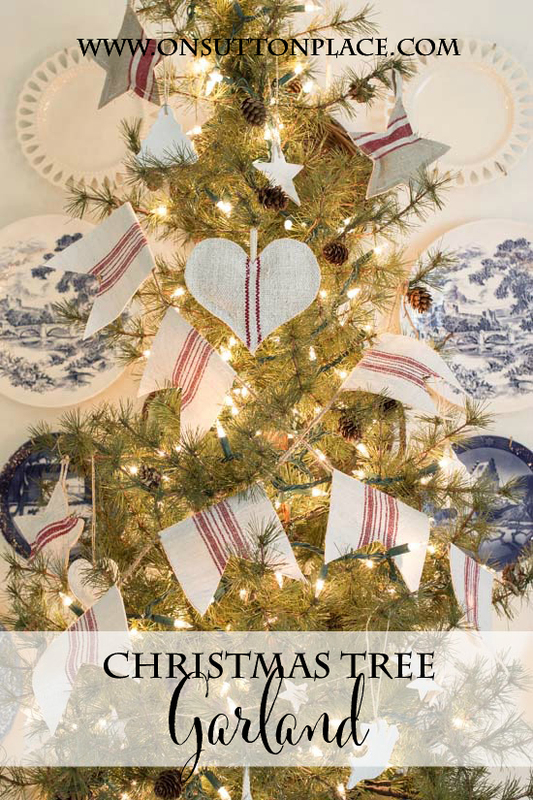 I love this cute little tree..and the mitten banner is adorable! Ha! I love crafts that you are almost embarrassed to tell us about because they are so easy, because if they are adorable then who cares. I think the mittens are so sweet. Why did it never occur to me to put evergreen sprigs in knit mitts? I could have done that years ago. Wouldn’t it be cute with all the single mitts you are left with through the years when the kids lose one mitt and you are left with the other one. Hi Grace…the idea of single mittens is adorable. I so wish I had kept some of my kids’ mittens. Thanks for stopping by! Easy and fun … Such a cute DIY .. !! Sooooo cute. Ordered me some mittens! Thanks for sharing. That is so cute Ann! So clever too. Right up my no sew alley! Ann, they are all three just as sweet as can be…I see how you are having a big decision on where to hang those sweet mittens. Can you see them from outside when they are in the window? Big decision! Thanks for the tutorials. 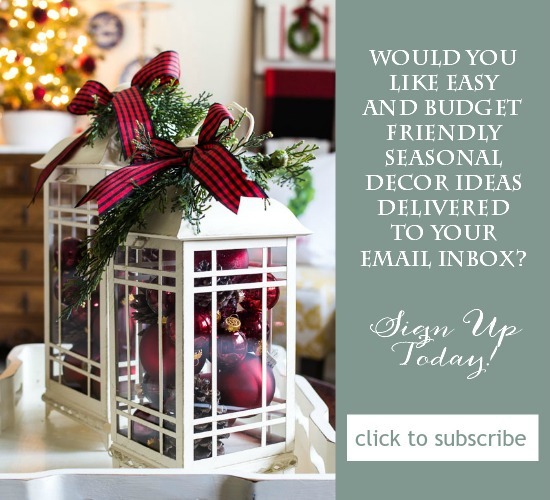 Dear Ann – Thanks so much for including the white mitten and twine and clothespin banner tutorial. Never feel embarrassed to include something simple for the likes of ME, LOL!! Not only does it look easy and simple to assemble but it’s also darling and nostalgic. I love it! It looks great against your antique brown chest. By the way, I’ve been enjoying your blog and look forward to more editions! Merry Christmas to you and your family. I am so in love with the mittens! Wonderful idea!! Sorry I just went back and reread that you purchased the mittens from Etsy. I love the white mittens garland. What a great idea. Where did you find the all white mittens? Love these banners! 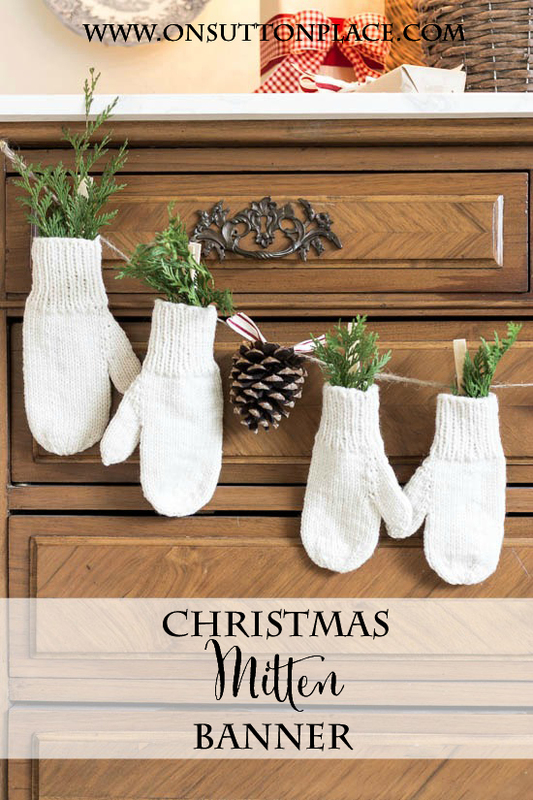 I love mittens and collect them when I am at thrift stores and yard sales to use in my Christmas decorating too. 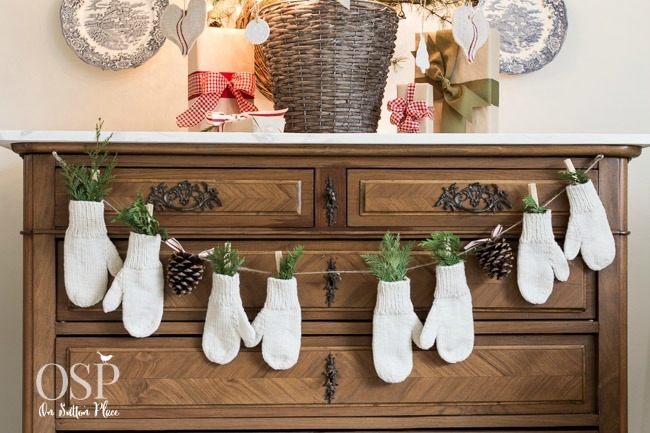 Love the mitten banner Ann, what an easy way to make a quick Christmas garland.